Welcome to another installment of LiveAnalysis! Today’s match-up: World Number 1 Novak Djokovic faces off against the soon-to-be World Number 4 David Ferrer. Interestingly enough, both men have dropped the same amount of sets on their way to the semifinal: 3. Another similarity: both had to perform rather spectacular escapes in matches that they very well could have lost. First Djokovic had to overcome the best match of Stan Wawrinka’s life, and found himself down an early break in the fifth set. Djokovic prevailed in a seemingly never-ending decider 12-10, and played what still seems like one of the great match points of the past few years. However, I think Ferrer’s escape was more remarkable, even though the drama of his 5-setter with Almagro was sucked out by the injury suffered by the Murcia man at the end of the fourth set. As we know, Ferrer found himself having to break to stay alive in the match not once, not twice, but three times. Also, unlike Djokovic (who barely escaped his fate), Ferrer was down two sets to none against his countryman. – Djokovic and Ferrer have met on a tennis court in six different years, and every single year since 2007. I’m laughing at that first encounter, in 2004. Djokovic was 17 at the time – and found a way to take a set off Ferrer on clay! – The two have met only on clay and hard courts (outdoor and indoor). On clay Ferrer has the clear edge: he’s won 3 of the 4 times they’ve played each other on that surface, with Djokovic landing his only win in 2011. Djokovic makes up for this with his 8-2 edge on hard courts. – Ferrer’s only two wins on hard court against Djokovic have come at the same tournament (albeit in a different location): the World Tour Finals. In 2007 that was played in Shanghai in outdoor conditions, while Ferrer’s victory in 2011 was at the O2 in London, which is indoors. – Novak Djokovic has won all four of the Grand Slam matches against Ferrer, but they’ve never met on the clay of Roland Garros. Djokovic has only lost a single set to the Spaniard in these four contests: last year’s wind-addled first stanza of their US Open semifinals. They’ve met twice in Australia, and twice in NYC. 1. Without the wind to wreck havoc in Djokovic’s mind, the key element to pay attention to will be how much depth can Ferrer get out of his groundstrokes, and how consistently can he keep Djokovic from bossing the baseline. On clay Ferrer has a little bit more time to defend Djokovic’s shots, which aren’t as penetrating as they are on a hard surface. But on hard, Ferrer’s tendency to leave plenty of balls well short of the baseline gets him in trouble against someone like Djokovic who absolutely loves it when he can stand on the baseline and fire away. This is Ferrer’s main problem against Federer, too. 2. Can Ferrer be aggressive enough to avoid having to play the entire match from a defensive position? In my mind, Ferrer needs to be as thoroughly aggressive as he was in his Davis Cup Final demolition of Tomas Berdych. In that match, Ferrer made Berdych have to move around and defend almost from the first point of the match. He needs to do the same against Djokovic, with the added difficulty that the World Number One tends to defend very well, and is having a great run of turning defense into offense with one swing of the racquet. Still, Ferrer needs to be the aggressor today, and keep Djokovic on the move. Ferrer needs to attack that FH side of Djokovic’s whenever he gets a chance – even if Djokovic gets an aggressive shot to that wing back, he often resorts to a FH slice that floats up and can be put away at net. 3. Who can dominate with their return of serve? These men are two of the three best returners in the world, and how much damage they can do with their rare skillset will be a key component in the match. Whoever can find ways to hold serve easily will have a huge advantage as well. 4. How much will Ferrer go for his backhand down the line? That’s a key shot today, as both men will get tangled in CC BH rallies. It opens the court for the Spaniard’s inside-out FH, which is always a good thing. The players have walked out onto the court, so we’ll be starting shortly. Remember to refresh this page often, as I will be providing game-by-game updates throughout the match! First Set – David Ferrer will serve first. 0-0: I love that Ferrer chose to serve when he won the toss. Smart veteran. It proves to be a good idea, as Ferrer gets some 1st serves in, and holds after a very loose BH from Djokovic finds the net. 1-0, Ferrer: A 40-love lead becomes a slim 40-30 edge after Ferrer blasts a FH DTL return winner. Being aggressive on Djokovic’s 2nd serve is absolutely pivotal for Ferrer today. Problem is, the Spaniard misses the next return, and Djokovic holds. 1-1: Ferrer with another strong, this time to 15. He’s getting 1st serves in, and placing them wisely – a winning combination. 2-1, Ferrer: A love hold for Djokovic, punctuated by a possibly blown line call that led to a beauty of a DTL winner for Djokovic. An ace sealed it. 3-2, Djokovic: Every single short CC BH by Ferrer is getting clobbered by Djokovic’s BH DTL. The ball sits up perfectly in Djokovic’s strike zone. He’s het to miss one. Djokovic consolidates with a love game. Ferrer has to be very concerned about how few points he’s winning on Djokovic’s serve. He’s gettng punished for every single short return, and is finding it increasingly hard to have an opportunity to attack once he’s being pushed back. Problematic. 4-2, Djokovic: Ferrer is clearly trying to do two things: get the ball up high to Djokovic’s BH (a questionable idea – didn’t he see all those Djokovic-Nadal matches from 2011? ), and looking to attack Djokovic’s FH corner (now that’s a sound plan). He’s trying to find some more depth than usual, but that comes at a cost: some errors bring him to deuce. After an ace by Ferrer, Djokovic illustrates why he’s the one who can turn the tables on Ferrer and go from an extreme defensive position to an aggressive stance by hitting a deep defensive lob and resetting the point. The next point? A ridiculous BH DTL passing shot straight at Ferrer’s feet. Moments later, Djokovic breaks again after Ferrer fails to handle a deep return. This match-up is such a mis-match on hard courts. It can’t help that Ferrer was out there for a long, long time against Almagro. However, the man from Javea needs to make a choice: will he go down because of Djokovic’s stellar play, or will he try to go for it and attack, risking more errors? I vote for the latter. 5-2, Djokovic: A most comfortable service hold for Djokovic, as the first set is in the bag in what seems like the blink of an eye. An interesting wrinkle for Djokovic was a good net approach, followed by a good volley. I’m usually very critical of the Serb’s transition game, but that point at 30-0 was perfect. There were way too many unforced errors for David Ferrer in that first set, and he had a horrible time returning Djokovic’s serve. In short, everything that could’ve gone badly for him, did. Time to throw caution to the wind and try to make something happen, Ferrú. Second Set – David Ferrer will serve first. 0-0: Ferrer just played his best game of the match: he was very committed to attack Djokovic with angled CC shots, and the plan worked quite well. That was needed, and Ferrer’s body language after that was encouraging. But now comes the real test: can he make any dent on Djokovic’s service games? 1-0, Ferrer: Djokovic is unrelenting in his aggression, and Ferrer is unlucky with a shot that barely missed the baseline. The result? Another easy service game for Djokovic. 17 year old ball boy….is that a wind up!!? Is being a ball boy now a career move?? 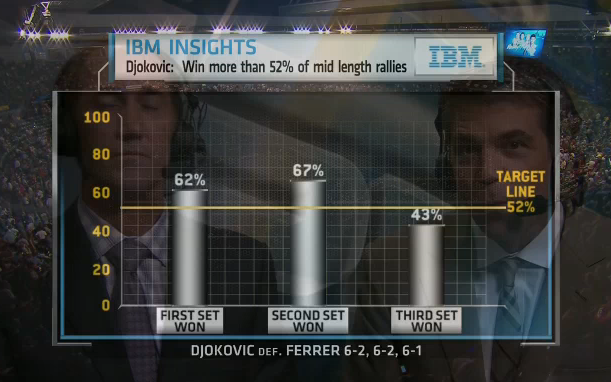 Ferrer had a few first serves in that game, but Djokovic handled them like they were second serves. The returns came deep, and Djokovic was always in great position for the next shot. The only “drama” so far? Djokovic called for some eye drops, which he used during the changeover. There you go. 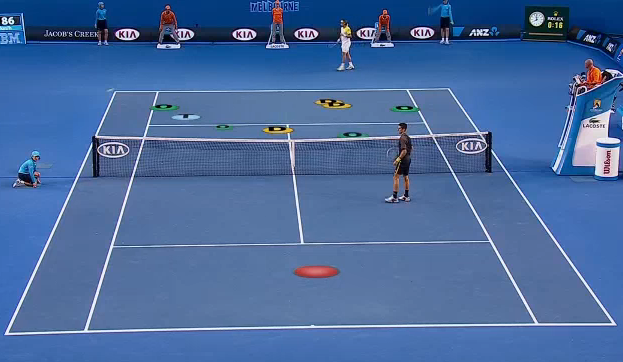 Look at where Djokovic places the ball. Look at the depth. 2-1, Djokovic: A lightning-quick consolidation of the break for Djokovic. So easy. 3-1, Djokovic: Djokovic turns on God Mode, fires away all sorts of missiles, and breaks again. 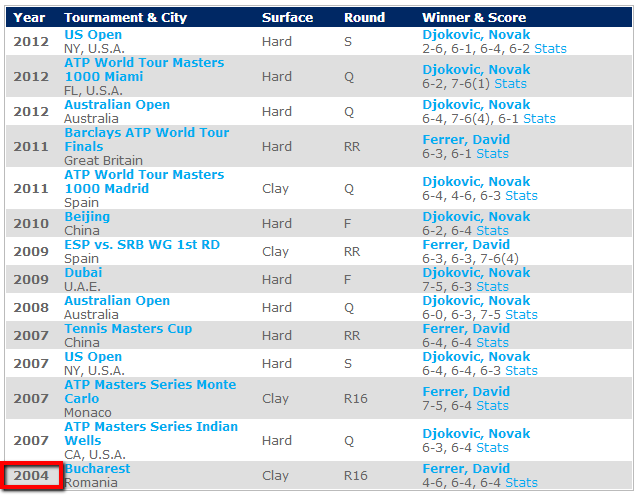 At this point in time, with 12 games having been played, Novak Djokovic has committed 5 UFEs. 5. And he’s not exactly massaging the ball. 4-1, Djokovic: Ferrer has his first lead in a Djokovic service game in like…ever? It’s 15-30, but Djokovic snuffs it out with a great 2nd shot off Ferrer’s return. More misery for Ferrer as he gets a great DTL return, only to see Djokovic somehow send a deep reply back. That has to be demoralizing. Ferrer compounds the bad situation by missing a CC FH. Djokovic holds after again bossing Ferrer far away from the baseline. Ferrer is so confused that he thought it was time for a changeover. Like a boxer who’s dizzy after such a beating. It’s not an insult to David Ferrer to point out that playing him, not Murray, in the SFs was and is a big prize for Djokovic (over Federer). 5-1, Djokovic: Djokovic hits an incredible running CC FH at 15-30, but then overcooks a DTL attempt badly. Cahill says that it felt like 45 minutes had passed since Djokovic last missed a FH like that. Djokovic follows that up with a bad dropper that stays on his side of the court, and then a BH into the net. A small reprieve for Ferrer, who seemed primed to face 2 BPs in that game. 5-2, Djokovic: Djokovic misses another bad dropper, but everything else in that game was excellent from the top seed and two-time defending champion. He’s flying to the finish line. Ferrer’s biggest problem is quite obvious: he’s not getting anything out of Djokovic’s service games – particularly when Djokovic gets 1st serves in. Ferrer has won all of 2 points played on Djokovic’s first delivery. That’s an appalling number for an elite returner. Of course, Ferrer isn’t getting much out of the baseline exchanges either. Third Set – David Ferrer will serve first. 0-0: At 15-30, Djokovic moves in for a short FH, and frames it. Seems like an opportunity lost, but at 30-all, the pair exchange blows for quite some time, and unfortunately for Ferrer, it’s him who cracks, missing another CC FH. A short while later, Djokovic gets the early break once again. 6-2, 6-2 for Djokovic vs Ferrer. A Demolition Man act right now. Plays way too fast for Ferrer. Serves great too and BH in a showtime day. A very good summary of what we’ve seen. 1-0, Djokovic: The only thing that’s not working for Djokovic are his drop shots: he’s lost all three points played on that kind of shot. No matter: the World Number 1 holds to 15. 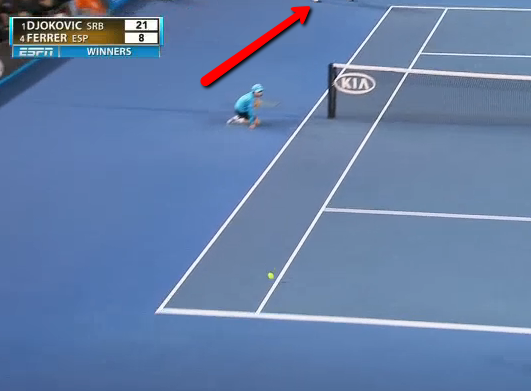 You can see where Djokovic was when he hit that shot, and of course, you can see that the ball was travelling through the doubles alley all the way to the last second, where it hit the line. Djokovic is in peak form. And Ferrer’s game, which usually doesn’t trouble him on hard courts, is simply the supporting actor who makes the lead shine. It’s such a mismatch from the baseline. From everywhere, really. 3-0, Djokovic: Djokovic holds at love, with the only difficulty coming from having to challenge an eventual FH winner. 4-0, Djokovic: After two FH UFEs from Djokovic, Ferrer has a chance to hold at 40-15. The Spaniard gets on the scoreboard for the first time in the third set when Djokovic shows off his questionable transition skills by approaching Ferrer’s FH with a harmless BH DTL slice. Needless to say, Ferrer’s passing shot goes by the Serb before he even has a chance to do his split step. 4-1, Djokovic: Djokovic holds at love once again, in a game punctuated by a beautiful reflex lob by Djokovic from the fore court. In related news, Ferrer has only managed to win 7 points during 11 Djokovic service games. 5-1, Djokovic: After surviving some crazy shots by Djokovic, Ferrer finds himself at 40-30 with a chance to hold. But he misses a big inside-out FH, so it’s deuce. A double fault sets up the first MP. A deep return seals the rout. Djokovic describes it as “one of the best performances of my career”, adding that he “played incredible”. Quite a display from the Serb. 1) A top player, reaches that peak/God Mode/untouchable kind of level of play. 2) The other player, who doesn’t match up well with the aforementioned possessed individual to begin with, isn’t as sharp as he/she needs to be to pull off the huge upset. Both of these conditions were met today, and as a result, we got a thrilling individual performance, but not a tussle. Djokovic was simple unstoppable tonight. The best player in the world provided a best in the world kind of performance: he played with unbridled aggression from the baseline, doing things with the ball that aren’t exactly high percentage options: changing the direction of shots with both his FH and his BH almost with every shot, and even injecting more and more pace while doing so. Djokovic made one of the best movers on tour look like a struggling junior, chasing the much stronger shots from a significantly more powerful and experienced opponent. Djokovic’s shots had great depth at an incredible frequency, and he painted the lines quite often. After the match, Djokovic was at a loss trying to remember a better performance in his career. I’ve seen him play like this in a few best of three matches, but never before in a best of five setting. Djokovic’s only “concern” heading into a very tough final against either Federer or Murray could be that maybe peaked one match too early. After all, the Serb has been able to dispose of Ferrer in the past without having to reach the heights reached today. Still, one does not choose when it is that every single part of you game works to perfection – and Djokovic has played enough big matches to know full well that he’ll be starting from zero in the final. After all, there’s no goal difference in tennis. As for Ferrer, it was a disappointing end to a pretty interesting run to yet another hard court Slam semifinal. His two weeks in Australia included his incredible escape from defeat in the quarterfinals against Almagro, a set lost to Smyzek, and great performances against Baghdatis and Nishikori. With his semifinal appearance, Ferrer will be ranked ahead of Nadal for the first time in ages, and at least figure nominatively among the game’s four best players when the rankings come out on Monday morning. However, the gulf between him and the members of the actual Big 4 have never been greater, one could argue. Particularly when he plays Djokovic or Federer on hard courts: it’s just such a mismatch. Unfortunately for Ferrer, his shots seemingly land exactly where the current top 2 players in the world want them. The height is perfect, the position on the court is perfect, the pace is perfect. Nothing Ferrer does seems to bother them; on the contrary, it seems to trigger great play from both the Serb and the Swiss. What’s worse, the mismatch turns some of Ferrer’s own strengths into weaknesses: one of the most amazing stats that come out of tonight’s semifinal was the fact that Novak Djokovic won all but 7 points on his serve (3 against the 1st serve, 4 against the 2nd serve). Over three sets. Against one of the truly elite returners in the game. Now, you’d think Djokovic fired an ungodly number of aces. Nope: he only had 6. But that just tells you how much Ferrer struggled with the depth of his returns (since he did get most returns back in play), and how willing Djokovic was to take the initiative once the ball was in play. Another of Ferrer’s strengths, his precise and trusty FH, was reduced to tatters. Djokovic completely overwhelmed Ferrer with his own FH, and the Spaniard made quite a few of his 32 UFEs with his own FH. If you add those two stats mentioned above, the 7 points won on Djokovic’s serve and the 32 UFEs, you can see where I was going with my theory about routs. And you can see how Ferrer found himself on the losing side of such a demolition. The Spaniard didn’t help his cause much, and that’s why he’ll leave Australia with only 5 games from his semifinal showing. My only critique of Ferrer is that he didn’t go all out in terms of aggression once the first set ended in such a clinical way. Also, given how Ferrer had narrowly escaped elimination in the previous round, one would be left to think that he was playing with house money and would just let it rip tonight. However, that’s a problem for Ferrer: he just doesn’t have the kind of power to do such a thing. He’s not Berdych. He’s not Tsonga. Ferrer tried to be more aggressive at times, and those attempts usually ended with Djokovic coming up with better shots, or with UFEs. There’s only so much you can do with the tools you have. And at the end of the day, even if Ferrer had played one of the great matches of his life, he still would’ve managed to lose in straight sets – just with a more respectable scoreline. That’s how good Novak Djokovic was tonight.